Fabric, Sticks, and MoreArt by the Utah Surface Design GroupOn display in the Crescent Gallery at the Utah Cultural Celebration CenterIn the Spring of 2018, the Utah Surface Design Group held a workshop at the Utah Cultural Celebration Center, led by Canadian fiber artist Alice Vander Vennen. 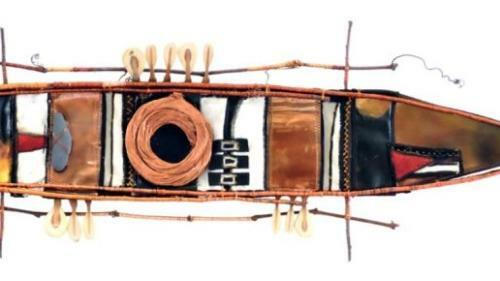 She shared her techniques of producing collages with various fabrics, sticks, stones, copper wire, and other found objects. This exhibit is the artwork made by USDG members who attended the workshop.Art Exhibit:March 7 – April 24, 2019Mon – Thurs 9 AM – 7 PM and Fri – Sat 9 AM – 4 PMEveryone is invited to the Fabric, Sticks, and More art exhibit free of charge.